* Postage was an additional USD 8 to the UK. The Spamutron weapon was an additional USD 3. After several project updates and very high proliferation across the Net by numerous popular LEGO sites, the package finally landed on my doorstep earlier this week. If you haven’t heard of it by now, I’m talking about Pigs vs. Cows: a set of minifigure heads developed by Guy Himber, aka V&A Steamworks. Pigs vs. 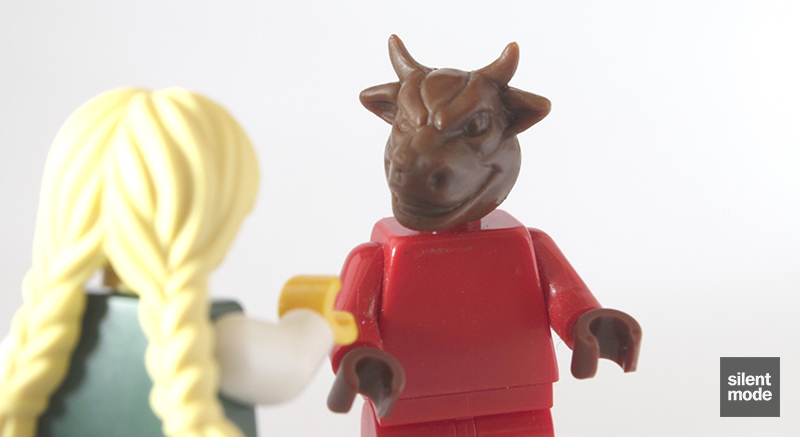 Cows is the theme for BrickCon 2013, and so Guy literally went HAM ( ^_^ ) and decided to produce a series of animal minifigure heads specifically for the convention. As mentioned on SilentMode.tv’s hallowed pages, he ran a Kickstarter project to raise funds for the injection moulding – and to nobody’s surprise, allegedly from the strength of his name, it was insanely successful. Stretch goal after stretch goal was achieved, with over USD 18,000 being raised in total. 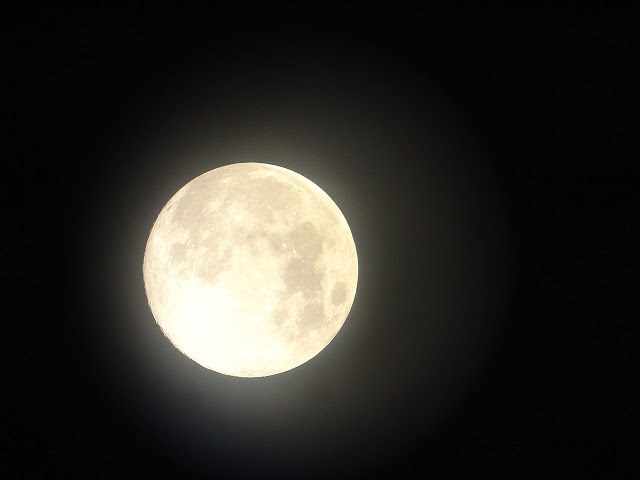 One backer, who shall remain nameless over here, reportedly donated a whole stack (USD 1,000). My disgruntled thoughts aside, I backed the project anyway and got myself a set of heads, as well as all the unlocked stretch goal rewards… with the aim of making sure I wrote a review. The inconspicuous package arrived in a padded envelope, thankfully with no customs charges attached. Each of the heads came sealed in their own compartment of the big plastic bag, and the other items came packaged in small ziplock bags. No worrying about anything getting damaged. I had originally wanted to get the Gingerbread Man, but at the time couldn’t justify spending another USD 28. Instead I opted for another paid extra, the infamous Spamutron custom weapon: designed in conjunction with BrickArms. They also produced some of their custom crates for the project. 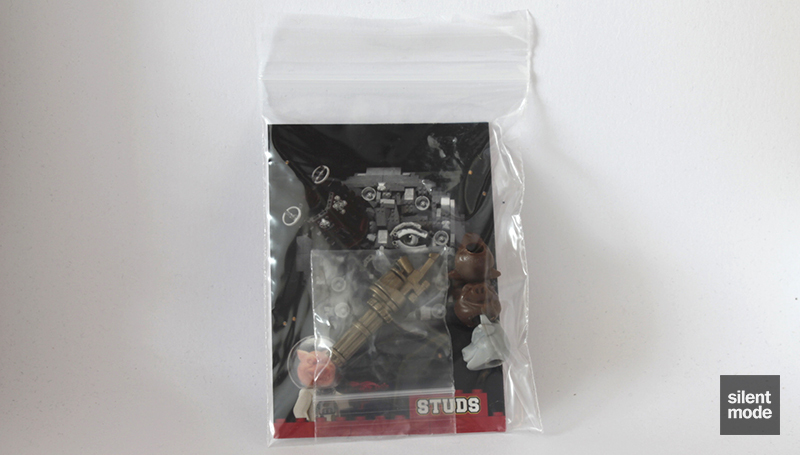 Also included in the bag are three extra heads, and two STUDS collectors cards. These, would you believe, are the result of yet another successful KickStarter project, and each of them feature a prominent (mostly Stateside) AFOL/LEGO personality. I’ve unwittingly become a collector as these are my second and third cards. There were a choice of flesh-coloured, brown and light grey heads when backing the project, and obviously I went for the flesh-coloured option. As a result of stretch goal after stretch goal being reached, a total of 11 heads were supplied in a single lot. The cat in the foreground is not a cow or a pig, as our more astute readers will notice. Not only was this head one of the achieved stretch goals, but it’s the precursor to Guy’s next theme: Cats vs Dogs. 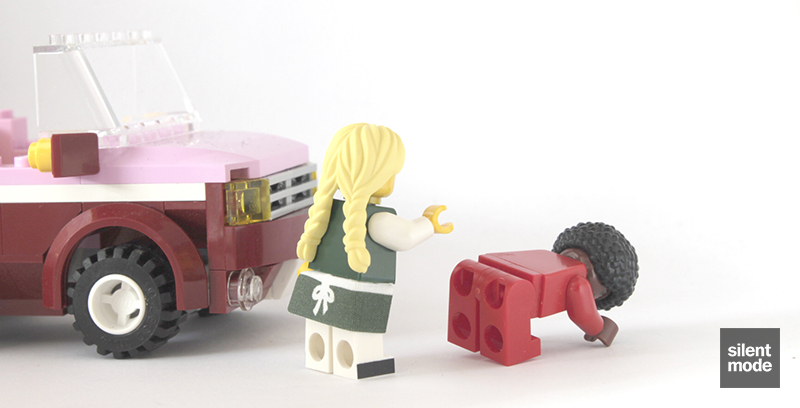 Zombies are ever popular in the LEGO community, and naturally one of the stretch goals was for zombie Cow and Pig heads. Pupil-less eyes and rotting skin – and let’s not forget teeth – characterise these heads. 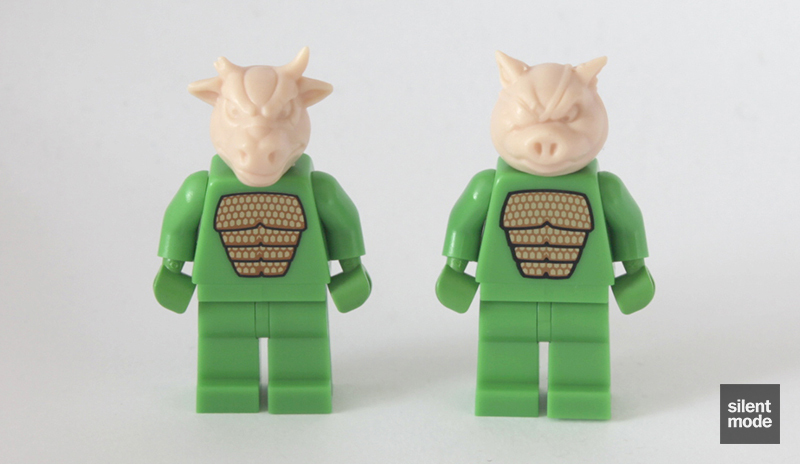 These look very similar to the regular heads, except the Cow has a scar over its left eye (and if you look very closely, a band-aid over its nose), and the Pig has an eye patch over their right eye. You’ll notice that, compared to the regular heads, these guys appear to be humbled. These guys are ready for war, and you can see it! Although they’re meant to be warring factions, it’s not hard to picture these two working together. These are smaller versions of the regular heads, designed to fit inside bubble helmets (think the lampposts from the Winter Village Toy Shop (10199)). 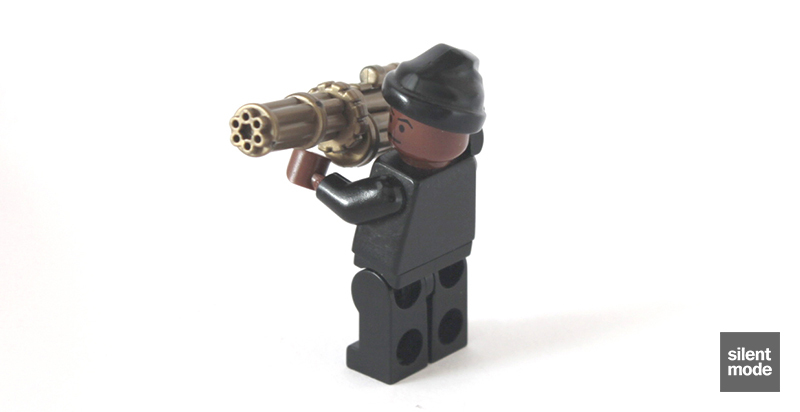 They actually look better for use among other minifigures than the normal size, IMO. Same thing for the battle damage heads. 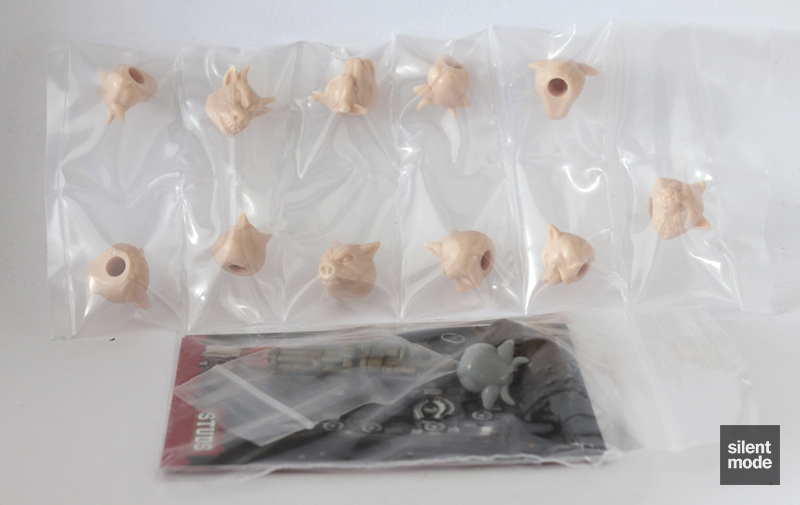 A few extra heads were added to the package in the other two colours – these were selected at random. The Reddish Brown more resembles LEGO’s classic Brown, and the Light Grey is very similar to Light Bluish Grey… as far as I can tell. All the colours lend themselves well to being painted, Games Workshop style. Finally we have the Cat head, who could very well be a double agent in this feud. It would greatly look the part if he came with a tail, perhaps as a skirt piece (ideas, ideas). The Spamutron looks like a combination of BrickArms weapons: namely their grenade launcher, minigun barrel, an assault rifle and a rotating magazine from one of their rifles. However the body of the gun is, as far as I can tell, a new mould. These were an added extra for pledges, with a limit of two per pledge. This weapon looks like it could do some damage, so here’s hoping it doesn’t fall into the wrong hands. These are very good quality, solid minifigure heads. Having had a go at designing and 3D printing custom elements, I can appreciate the time and effort that went into designing the heads, particularly as they were to be injection moulded. If there’s anything to be envious about, more so than having a successful Kickstarter project, it’s having access to those kinds of resources in the first place. I went for the flesh-coloured heads as they’d be easier to notice details on, compared to the Brown heads. Each pack was offered in one colour, though I think the Pigs are best suited by flesh, the Cows brown and perhaps the zombie heads in grey. If Tan was introduced it would probably be the most popular colour, but as things stand they all work. In hindsight I was glad I didn’t go for the Gingerbread Man, and I was content with my choice of the Spamutron, which I thought was the most appealing added extra next to the custom crates. 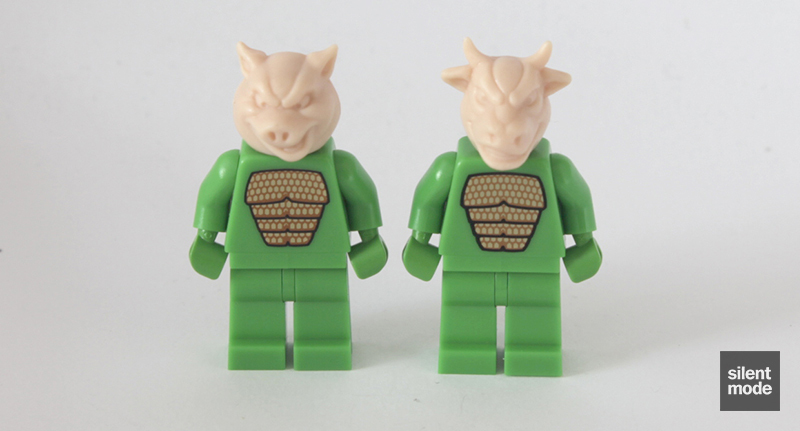 I can only imagine the kiddies going crazy over these heads, and any custom figures that arise from them: if not through the Kickstarter project directly, then through BrickCon. Unlike in some other arenas, there’s no sucking up to anyone on SilentMode.tv. That said, although I probably wouldn’t use these heads myself, the whole process (from crowdfunding to finished items) was very well executed, and I can’t find any reason to dislike it. After some deliberation, today’s score out of thin air is a respectable 9.0/10, solely because deducting points for “not being my thing” is out-of-order. I’m not sure if you can still obtain these heads and accessories, but if you like them and you get the chance, I say go for them. Also watch out for this Cats vs Dogs idea that was mentioned some time ago; I’m certain it will do just as well.